SMB: Those three letters are enough to make a gamer recall some of the greatest and (occasionally) some of the hardest times of their lives. Everyone who’s played SMB can think back with a sense of triumph to their successes, and more specifically, to their failures. Sometimes the memories might have more to do with what went wrong, sure, but there is definitely a point at which that success, that victory, is achieved. When that happens, it all becomes worthwhile. 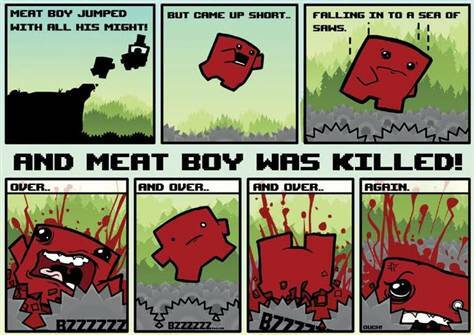 And so it is with SMB: Super Meat Boy. Oh, you thought I was talking about that other one?